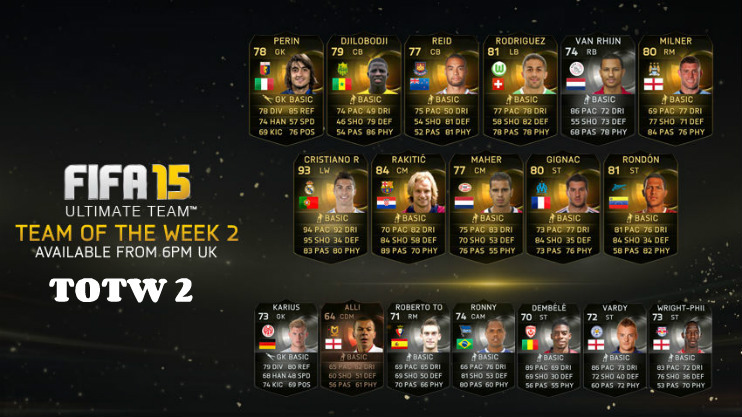 The second ever TOTW (Team of the week) in FIFA 15 Ultimate Team hasn’t disappointed just like the first, with none other than Cristiano Ronaldo making his 1st, and certainly not last appearance of the season. His hat-trick for Real Madrid secured his place, whilst James Milner’s impressive all-round display for Manchester City in their game against title favourites Chelsea earned him a spot. New York Red Bulls striker Bradley Wright Phillips also scored a hat-trick too which nailed him a place in the reserve squad. The best Silver of the week was no doubt Ajax right-back Van Rhijn who scored the winning goal against Feyenoord. The best Bronze goes to MK Dons wonder-kid Dele Alli who goes from 55 overall up to 64 with this in-form. All of these IF players will be available to obtain in gold packs from 6pm (UK time), on September 24th 2014 up until 5:30pm (UK time), on October 1st 2014. Check out the full starting eleven, substitutes bench and reserves below. Make sure you follow us on our social media platforms if you want to stay up to date on all the FUT 15 happy hour information and we’ll let you know when EA are releasing the special promo packs as they’ve got more chance of getting you a rare IF player. Also, let us know if you get any of these players in packs or who you felt should have made it into the final cut by using the comments section at the footer of this page.